MIAMI — Hollywood seniors received a taste of the Big Leagues on June 14. 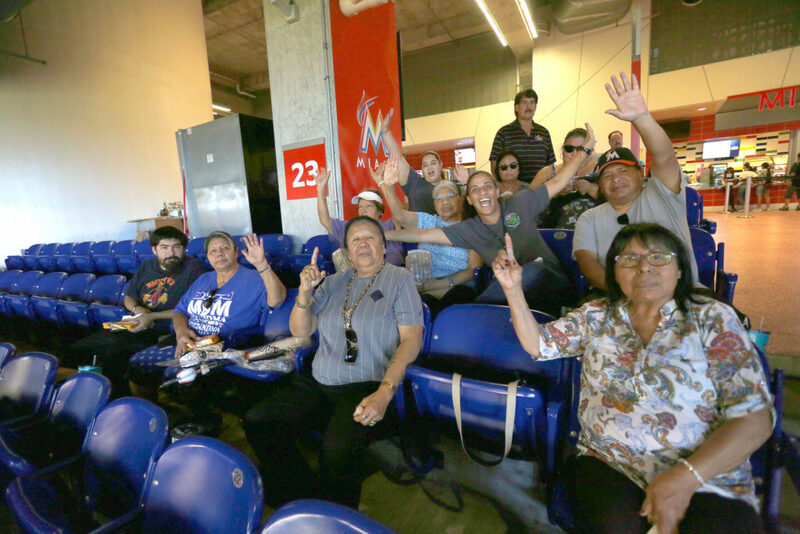 The Hollywood Senior Center organized a trip to Marlins Park to see the Miami Marlins host the San Francisco Giants in a rare weekday matinée. Most of the 9,726 fans in attendance were kids from various organizations who arrived in large groups. The Senior Center group, which consisted of about a dozen people, arrived on a bus driven by Joe Kippenberger. They sat in the final few rows of Section 23 on the left field side. They all had barely settled into their seats with their hot dogs and popcorn before Andrew McCutcheon and Mac Williamson smacked home runs to give the Giants a 3-0 lead after an inning-and-a-half. Thunder and rain started about 1 p.m., but thanks to the park’s roof, there was no delay. The Marlins clawed their way back into the game with runs in the fifth and seventh innings. With the Marlins trailing 3-2 in the ninth inning, the group decided to head back to Hollywood. The Marlins made sure there was more baseball to be played. They pushed across the tying run on a one-out sacrifice fly by Lewis Brinson. The game remained knotted at 3-3 all the way until the 16th when the Giants scored three times and emerged with a 6-3 win that lasted four hours, 49 minutes. It was the longest game of the season for the Giants, and the second longest for the Marlins. On deck for the Hollywood seniors is a trip to Hawaii in July.